One of the enduring questions of our time is this: How do cultures characterized by moral pluralism promote human flourishing, despite vastly different visions of the good life? With the Enlightenment’s turn away from the medieval Catholic worldview, modern moral philosophers sought to construct a unifying view of morality that didn’t depend on religiously based values. Increasingly, this involved attempts to ground morality in various “scientific” ways, capable of some sort of empirical verification. Science and the Good is the historical and sociological record of this quest. The book’s subtitle—The Tragic Quest for the Foundations of Morality—gives the reader a preview of the authors’ conclusions about the success of this quest. While recognizing the need for a common foundation for a moral culture (19), they ask this question—”Can science demonstrate what morality is and how we ought to live?” (11). In other words, can science move beyond descriptive ethics to normative ethics—can it tell us not only the origins of morality and how people and cultures make moral decisions, but also give us enduring moral norms that can unify pluralistic cultures? Yale University Press (2018). 312 pp. $26.00. 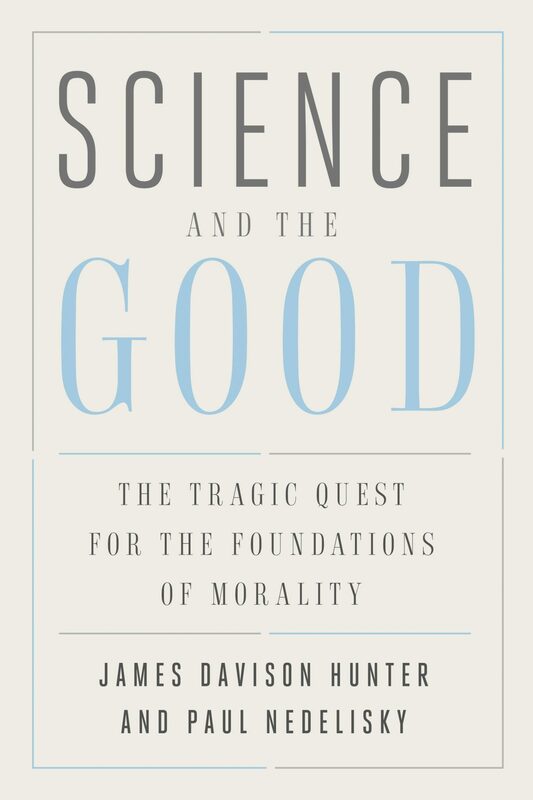 In this illuminating book, James Davison Hunter and Paul Nedelisky recount the centuries-long, passionate quest to discover a scientific foundation for morality. The ‘new moral science’ led by such figures as E. O. Wilson, Patricia Churchland, and Joshua Greene is only the newest manifestation of an effort that has failed repeatedly. Though claims for its accomplishments are often wildly exaggerated, this new iteration has been no more successful than its predecessors. Hunter and Nedelisky argue that science cannot tell us how we should live or why we should be good and not evil, and this is for both philosophical and scientific reasons. In Science and the Good, University of Virginia professors James Davison Hunter (a sociologist of knowledge and culture) and Paul Nedelisky (a philosopher) give readers a selective survey of the history of ethics for the past 400 years. They present and assess the three main schools of moral philosophy: the moral psychology of Hume; the utilitarian ethics of Bentham/Mill; and evolutionary ethics, the attempt to account for morality as a product of evolutionary development. The authors conclude the survey with a discussion of newer trends toward a scientific morality based in neuroscience and moral psychology. The historical survey is only half the book, however. Once this groundwork has been laid, the authors begin their assessment of the quest for a scientific basis for morality. They distinguish between three levels of results. Level one would provide specific moral norms that could help settle enduring moral debates and tell societies what kinds of things are morally valuable. Level two findings wouldn’t provide the moral obligation that level one provides, but “would give evidence for or against a moral claim or theory” (100). Level three provides what is commonly called “descriptive ethics,” telling us how moral decisions are made, and the origin of moral norms (100). The book is full of insightful commentary on the historical figures and the current evolutionary and neuroscientific bases for morality. The authors maintain that the neural or evolutionary basis for particular traits or virtues may be interesting but tell us nothing about whether they should be adopted or rejected (143). They’re insightful in their critique of contemporary “science of morality” advocates Michael Shermer and Sam Harris, in that they both make “assumptions about what is valuable, independent of science” (158). They also cite the shift of emphasis from morality being “a source of objective action-guidance” to “understanding morality socially (and psychologically) and prudentially” (183). They further point out that this quest for moral foundations has proceeded apart from any reflection on the dynamics of power and position (201–2). The list of insightful comments could be multiplied substantially. They conclude that the scientific quest for morality has failed, largely because the prior commitment to philosophical naturalism precludes anything resembling traditional morality. This is where Nedelisky, the philosophical member of the co-authoring team, significantly contributes. In what seems to be almost a side comment, the authors state that “no one in fact has any idea how enchanted [non-scientifically verifiable, such as souls, etc.] features [such as morality] emerge from scientifically tractable reality.” To put it differently, no one has any idea how we get moral properties from mere matter—chemistry and physics. No one has any idea how we get moral properties from mere matter. Even atheist philosopher J. L. Mackie famously regarded this as a fundamental difficulty with atheism. He put it this way: “Moral properties constitute so odd a cluster of properties and relations that they are most unlikely to have arisen in the ordinary course of events without an all-powerful god to create them” (115). Atheist philosopher Thomas Nagel, whom Hunter and Nedelicky reference, maintains in Mind and Cosmos (controversially in the philosophical community) that naturalism can’t account for moral properties. Some suggest that moral properties emerge from physical properties in the same way that wetness emerges from the combination of hydrogen and oxygen. But those are physical properties that emerge from physical reality, not non-physical properties emerging from the physical world. The authors reject the scientific quest for morality, but they also say that “to look to religion for such a unified, socially binding foundation [for morality] is out of the question” (191). In what sense is that true? They may mean it’s historically or culturally true, given global religions’ penchant for violence and divisiveness. Or as a practical matter, it can’t be such a foundation given the non-religious segments of most cultures. But it should be noted that ontologically, morality and moral properties are most at home in theistic worldviews, though the authors don’t attempt to make this point. Their work shows the awkwardness of trying to situate morality within scientific naturalism, and that its proponents have largely given up the original quest. Instead, the authors argue that we should find a common understanding through our differences rather than in spite of them, but they don’t explain what that might actually look like. Perhaps that is the direction of a follow-up work, one that will address the pressing issue of getting along amid deep and passionate differences about morality.